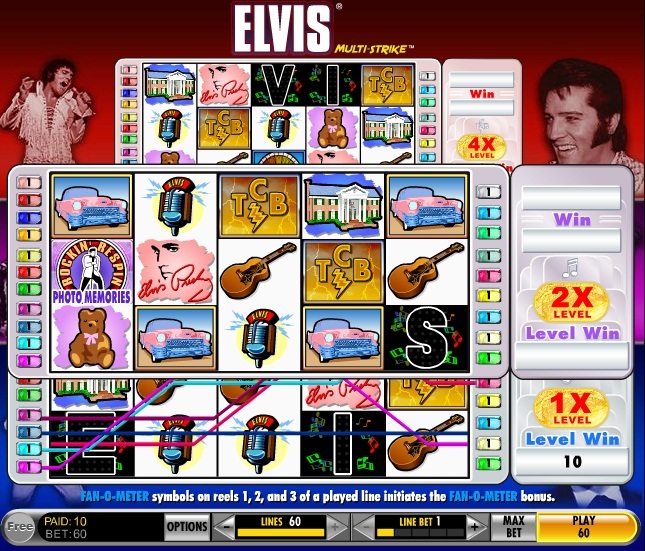 If you have played slots in Vegas then you might have come across the Elvis Multi-Strike slot. It is pretty hard to find and is normally occupied, but if you have a good look around you can normally find one. The slot game has been replicated online by IGT. 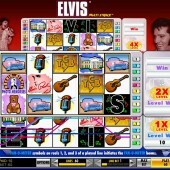 The Elvis Multi-strike video slot has an unusual format which goes up in levels as you hit winning lines. There are three levels with increasing multipliers on each. On the first level it is just 1x win, but goes up to 2x on level 2 and 4x on level 3. As you rise up the levels the music speeds up and the game gets very exciting. It can also be very rewarding, if you hit some winning lines at 4x multiplier. A Little Less Bonus, a Little Less Action? The online version has only two of the bonus games, compared to the three in the offline slot. To be honest, these are mainly for show anyway, as the wins from them are generally pretty lousy. There is the fan-o-meter bonus, which is calculated by fan cheering to Elvis in a clip you have picked. The other is the Photo Memorabilia Bonus and you get random rewards for a dial selecting pictures from Elvis performing back in the day. Of the two Elvis slots (Elvis A Little More Action being the other one) this one is my preferred slot. It just has a little more excitement, even if the bonus games are a bit weak. It might sound strange but I probably had more pay outs on A Little More Action but if we are looking at general game play and long-term enjoyment then this slot wins hands down. If you like themed-slots then you might also like IGT’s Monopoly slots.